Looking for the best and easy recipe for a classic, melt-in your-mouth New York Style Cheesecake? Rich and dense, but creamy and smooth at the same time, this cheesecake is absolutely delicious! Finely here I am today, sharing the recipe for easy take on a classic. After all these years of blogging, I realized that I have a dozens of cheesecake recipes, but non for a classic, go-to, basic cheesecake. 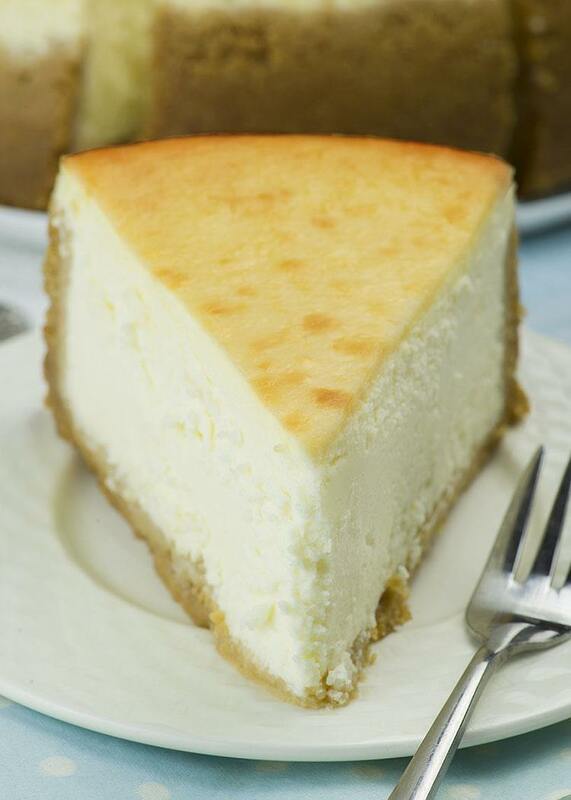 In order to make it right, I get back to the start with this New York Style Cheesecake recipe. Cheesecakes are my greatest love in a dessert world. I love any kind of cheesecake, bake or no bake, regular size or mini cheesecakes. Crazy about these sweet and decadent desserts I even transformed them into a truffles, fillings for cake, chimichangas … I just can’t help it. As I said, I love experimenting with all sorts of cheesecake creations so I carried away and forgot to show you how to make a classic cheesecake. New York Style Cheesecake is just a simple combo of basic graham cracker crust and smooth and silky cream cheese filling. It’s a bit tangy but rich in texture thanks to addition of sour cream in filling. 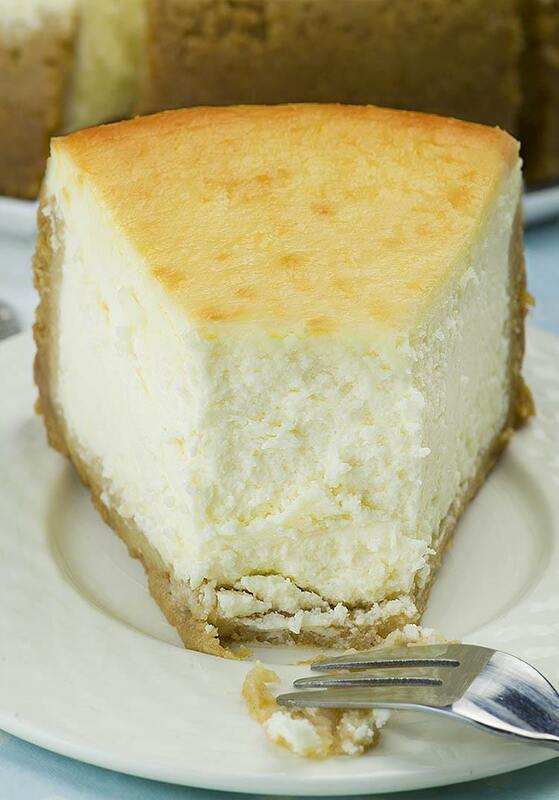 Some types of New York style cheesecakes use sour cream for topping, but I like to mix it into filling. That’s easier than applying it onto cheesecake after cooking and replace it in the oven, making the cheesecake twice-baked. In order to achieve rich and dense, but smooth and creamy consistency of a cheesecake, make sure to use full fat cream cheese and room temperature ingredients. The most common issue is how to avoid the cheesecake cracks at the top. That won’t look good if your cheesecake doesn’t have topping. Cracks may be caused by over beating the batter, so make sure to run your mixer on low speed. You don’t want to incorporate a lot of air into the batter. Just slowly combine ingredients until smooth. Cracks could also appear because too much moisture is lost during baking or the cheesecake is over baked. That’s way you should always use water bath. Water bath keep moisture and also evenly distribute the heat. 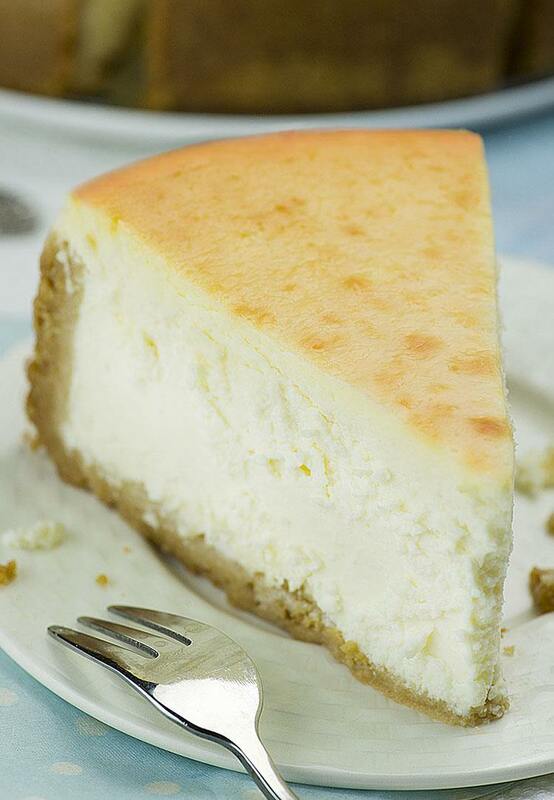 Above all, cheesecake should have nice, smooth and creamy consistency. That’s way you don’t want to over bake your cheesecake. When it’s done it should be firm but the center should look a little wet and if you shake the pan gently it should still wobbles a little. Don’t worry, it will firm up as it cools. Also a good trick is to turn off the oven after baking and let your cheesecake sits in with a door slightly open. Wait for an hour before bring it out at room temperature. It will prevent failing and cracking. Given these points, making perfect cheesecake is really simple and easy. Get on and bake! The best and easy recipe for a classic, melt-in your-mouth New York Style Cheesecake recipe. Place double layer of extra large aluminum foil under your 9 inch springform pan and cover the bottom and sides of the pan, wrap it tightly around the sides to make sure no water gets in during baking in water bath. Beat in salt, vanilla, lemon juice and cornstarch. Beat in eggs one at a time. Run your mixer on low speed. You don’t want to incorporate a lot of air into the batter. Just slowly combine ingredients until smooth. Beat in sour cream and heavy whipping cream. Place in the oven and bake at 325 F for 1 hour and 45-55 minutes. Remove the cheesecake from the water bath, dry the bottom of the pan, run a thin knife around the edges to loosen the cake and let it cool to room temperature. Cover the top and place it in the fridge to chill for at least 5 hours or overnight before serving. Release the ring from springform pan before serving. What is water bathing? Can you post any pictures to help with making this? I’m just starting out learning to make things, so I don’t have many dishes but can buy some, springform pan and roasting pan? 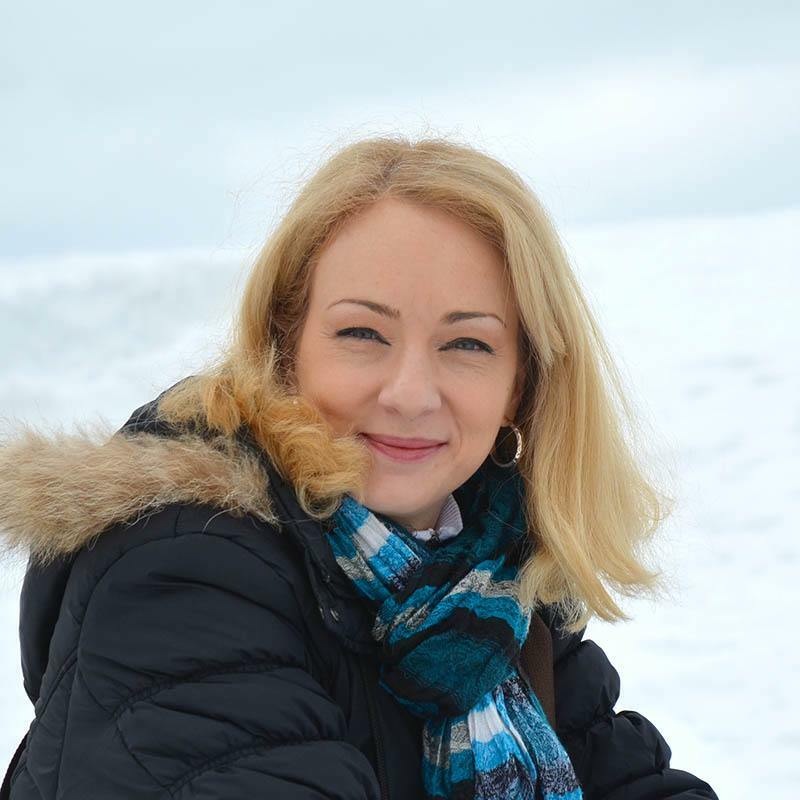 She describes water bathing in the body of the directions. I was perplexed at first as well. The directions are good. A spring form pan has sides that sit down in the bottom and then there is a clasp that makes it fit tightly enough to hold the batter. That way when the cake is done, you unlatch the clasp and there’s your cake! A roasting pan is a very large pan that you might use to cook a turkey. Can you clarify the cook time please. At the top of the recipe it says cook time is 1 hour and 10 min and in the recipe itself it says 1 hour and 45-55 minutes. Which is correct? Thank you! The cheesecake tastes amazing but for some reason it raises a lot and cracks a lot. I’m following the recipe to the t but it still does that. It really bothers me so today is the second day I make it in a row but still the same result. Do you know what the reason for that might be? Hi Ventsi, I guess you beat the batter more than it should and incorporate to much air after adding eggs and cream. Question? If the cook time is eally 1 hour and 45-55 minutes why wasn’t that corrected at the top of the recipe. I don’t want to waste all my ingredients if it is over baked. Please clarify for me. Yes, it’s 1 hour and 45-55 minutes. I found that 1 hour and 45-55 minutes was over baked as well as the time for the crust. This is a delicious cheesecake!! Do You to the pan with the filling? Or half way only? Followed recipe to a T, cheesecake came out perfect. I wrapped a double layer of foil around the spring form pan and placed the pan in a slow cooker bag and secured it around the foil, placed it in a roasting pan and added water halfway up the sides, cheesecake was perfectly cooked in 1 hour and 45 minutes. Awesome idea to add the slow cooker bag! Thanks!! This cheesecake is amazing. I think I overbaked it as I miscalculated the timer. Totally my fault. I was looking at recipes to try for Christmas and this is the one. Although I am going to try the oven bag that someone had mentioned previously. My crust got soggy while taking its bath. Lol. It hardened up in the fridge though. No cracks, and tastes amazing. Thank you for the detailed step by step directions I am not that great of a cook, or baker. Now everyone will be thinking I lie to them about it lol. Thank you. Mine is in the oven now, and after reading the reviews, I see I forgot to bake the crust first, well now what should I do ? Hope for the best is all i can do…..Anyway, things happen… Merry Christmas…. Merry Christmas Bobbi! I hope everything was well at the end! 2 pounds of cream cheese? 45 too 55 minutes then an hour with the oven door ajar? 1 hour and 45-55 minute, than leave it in the oven for 1 more hour . Made this last night and it came out PERFECT!!! No cracks, it was rich and the crust was so good. I love baking cheesecake as it’s my husbands FAVORITE dessert. THANK YOU FOR POSTING THIS RECIPE!! Will be using it from now on!!! Thanks April! I’m so happy to hear that!